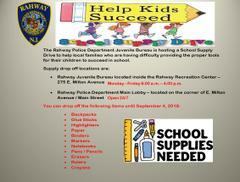 Rahway Police Juvenile Bureau is hosting a school supply drive through September 4th. The Rahway Police Department Juvenile Bureau is hosting a school supply drive to assist local families who may be having difficulty providing the necessary supplies to help their children succeed in school. Please consider donating to this worthy cause. Drop off locations are conveniently located at the Rahway Police Juvenile Bureau (inside the Rahway Recreation Center) and the Rahway Police Department headquarters lobby. The supply drive will run through September 4, 2018, and will directly benefit Rahway school children.